Home ♦ Coffee Shops ♦ No new summer drinks from Starbucks? No new summer drinks from Starbucks? Starbucks rolled out new menu boards and signs (which are very nice, by the way) to launch their summer promotions this week, but unlike last summer and the summer before, the “new” menu doesn’t include any new drinks. 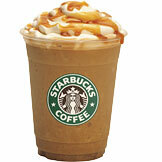 Probably due to cost cutting somewhere down the line, Starbucks has opted to promote Caramel Frappuccinos and Iced Coffee as their two big summer beverages this year. Both these drinks are good – and you can get the iced coffee sweetened or with mild added to it if you’re not the black coffee drinking type – but it’s a bit of a let down for some customers who look forward to trying something new. They have to wait until the next promo period comes around to see if any new drinks make the cut then. If you want a new Starbucks drink right now, consider heading over to a Barnes and Noble Cafe Starbucks instead. The one I checked out this week was offering Mocha Mint Chip Frappuccinos (which have been available at the regular ‘bucks before) and Mocha Toffee Chip Frappuccinos.